The adductor group is made up of five muscles (pectineus, gracilis, adductor longus, adductor brevis, and adductor magnus) that attach the femur (thigh bone) to the pelvis (pubic region). They have an important role when kicking, accelerating and rapidly changing direction, thus the load on this region is extremely high during many sports such as football. Some studies have demonstrated that having had a previous groin injury almost doubles the risk of developing a new groin injury, and playing at a higher (elite) level almost triples the risk of developing a groin injury. 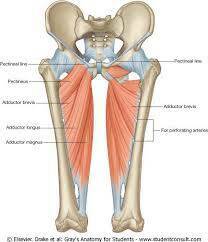 There is also a relationship between limited hip mobility, groin muscle weakness and pain in the region. The take home message here is that strengthening of the adductors and lumbopelvic region generally is crucial to address adductor related groin pain. Many people still continue to rely on rest and stretching as a stop-gap approach to management, never really addressing underlying strength deficits. The Copenhagen Adductor exercise https://www.youtube.com/watch?v=lBIcQzr-cQs is an excellent way to load the adductors to a high degree. Knowing when and how to incorporate it into your own training is key to its success. If you have a current groin issue or generalised long-term concerns feel free to reach out to Andy at andrew@evokerpps.com.au with any questions.